We are currently testing two Zeus-based Scrypt ASIC miners and since they do require a special miner software with support for the chips, we are providing the latest version of the miner with the source code. 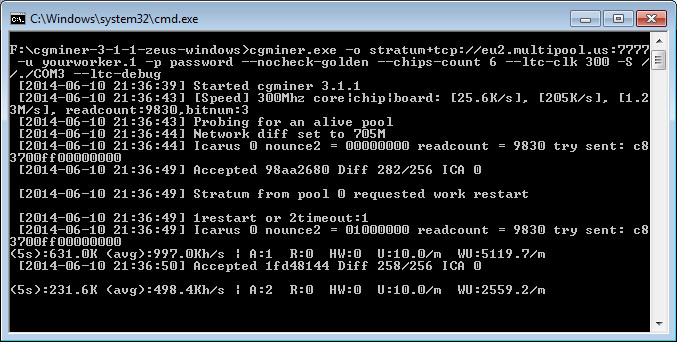 It is a modified version of cgminer 3.1.1, a bit old version already, that has the Icarus driver modified to work with the Zeus ASIC hardware, but this is all we have for the moment. You need to set the operating frequency and the number of chips of the ASIC miner you use as command line parameters, for example a 300 MHz frequency seems to be the default one and the ZeusMiner Blizzard has 6 chips. You can check the Readme file and also find an example bat file for running the GAWMiners Falcon Scrypt ASIC that has 128 chips and is recommended to be used with a frequency of 328 MHz and is getting you about 27 MHS hashrate. The ZeusMiner Scrypt ASIC miners and the miners sold by GAWMiners and HASHRA that are based on Zeus ASIC chips do rely on a virtual USB to COM driver, so you may need to download and install the latest Silicon Labs CP210x USB to UART Bridge VCP Drivers. After that you need to see what is the number of the virtual COM port of the ASIC device from the Device Manager of the computer and set that port as a command line parameter.